The professionals at Ambrico are proud to have recently renovated St. Luke’s Hospital in Kansas City, Mo. with their elegant, yet versatile, thin brick. Resulting in a cladding system in decipherable from traditional brick, Ambrico’s veneer panels provide builders and homeowners with an appearance of real brick at a fraction of the cost. 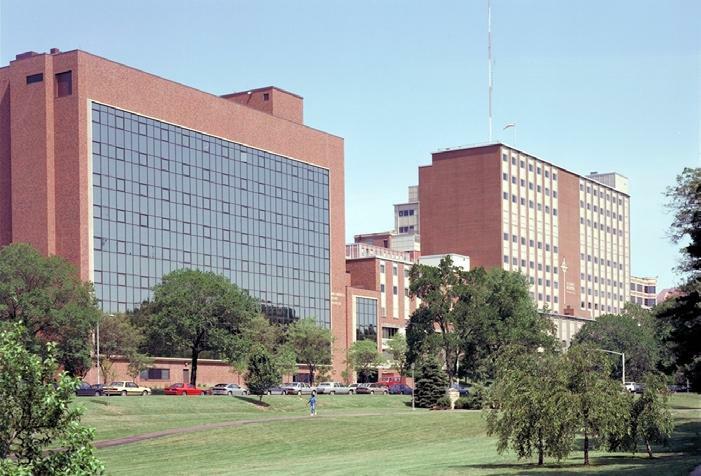 Once Ambrico’s experts analyzed the hospital’s exterior structure, the original siding was quickly replaced with new brick siding for a bold look of integrity and authenticity the hospital needed. Made with only a portion of the components of traditional brick, the cost of thin brick is much more affordable with added durability — due to its decrease in materials. The result is an elegant alternative-cladding system that preserves the look of traditional masonry and provides the hospital with a stunning new atmosphere. Ambrico’s thin brick system was attached to the hospital’s original facade surface and applied to produce the strength of real brick at a overall depth of only 5/8 inches. The utilized EZ-Wall® System is architectural-steel grade, hot-dipped galvanized to G-90 finish, embossed, and maintains approximately the same thermal coefficient as brick and mortar. Ambrico’s veneer brick eliminates the need for lintels,which greatly reduces the overall project cost. Each panel was completed with full-depth mortar joints to ensure long-term security and is virtually indistinguishable from traditional bricks. St. Luke’s Hospital has brought medical advances to the world for more than 125 years. As a faith-based, non-profit health system, the hospital has maintained a strong history of innovation since 1882 and earned recognition for excellence in quality health care. St. Luke’s has ranked among U.S. News &World’s “America’s Best” hospitals for cardiovascular expertise, heart surgery, urology, and gynecology, and delivers award-winning “Saint Luke’s Care” to 11 regional hospitals and medical facilities in the Kansas City metropolitan area. Serving the entire United States from its home base in Warren, Michigan, Ambrico uses its patented EZ-Wall® engineered thin brick system to economically replace and accent all types of siding products with genuine clay, kiln-fired thin brick, incorporating the look and feel of traditional brick veneer in a wide selection of brick colors, textures and finishes to complement the design and site requirements of any project.